Luxury antique white damask linen table napkin that can be personalised with embroidered names, initials, house name or little message of your choice. Quality 100% linen table napkin approximately 47cm square. Running stitch hems and quality linen fabric. The epitome of luxury dining, this cloth napkin is made from linen that is known to last and improves with age making this napkin a lovely keepsake gift. Fantastic for weddings, anniversaries, christmas dinner and other special occasions. 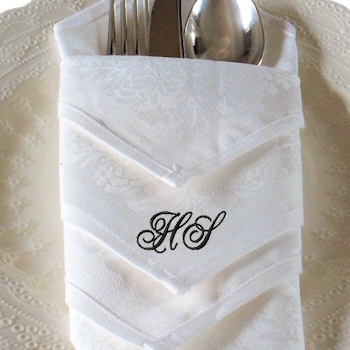 This napkin will be embroidered with a name, message or intials of your choice by Amys Gifts.